Let's cut to the chase. 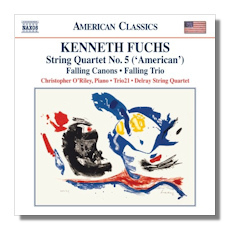 Yes, the titles may seem abstract, and yes, this is the dreaded contemporary music, but this excellent Naxos album could go a long way in establishing Kenneth Fuchs as a legitimate voice in American music. We have here a piano suite, a string quartet, and a piano trio. Three distinct types of music, all expertly well done and very engaging as a whole. Falling Canons grew out of a theme based on a work for baritone and piano following 9/11. Fuchs has taken one of his main themes and crafted a thought provoking set of seven movements for solo piano that explores the changes in the world following those terrorist attacks. It was composed specifically for the pianist here, Christopher O'Riley, and sounds marvelous. It's a truly effective 9/11 tribute by virtue of the fact that there is no text, just raw emotion that rises, then collapses, then rises again and so on. The "American" String Quartet was commissioned by the Delray musicians, who are based in southern Florida. The composer suggests – the notes for this release are his own – that the quartet suggests the American spirit. It is my suggestion that you treat it as absolute music, although Fuchs is right in saying that he was heavily influenced by this country's symphonic history. There's a little bit of everything here, fun, nobility, and above all great art. The Delray play this work as anyone who has a work written for them should, with great care and obvious affection. Trio21 includes cellist Robert deMaine, someone who I "grew up" with as a young Detroit Symphony patron. He, along with Jeffery Biegel and Kinga Augustyn, tackle Falling Trio, which shares themes with Falling Canons and the earlier work mentioned, Falling Man. Biegel commissioned this piece, and again the musical writing is striking. By not saying anything, Fuchs says everything. This 13-minute, one movement trio is just as hauntingly effective as the opening seven movements for piano, maybe more so due to the skillful and honest instrumental writing. If you're someone who winces at new music, or generally shies away from "American" music of this nature (tributes, etc), I suggest you try this disc. It's very good, and deserves your time, both for the excellence of the music on display, and for the commitment and obvious depth that the performers bring.